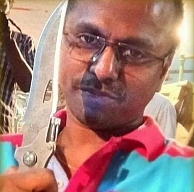 For Murugadoss,Kaththi takes precedence, even on a birthday ! Ace director A.R.Murugadoss is celebrating his birthday tomorrow, the 25th of September. Being the true professional that he is, ARM will be busy in Nellore tomorrow shooting some scenes for Kaththi involving a crowd, and will return to Chennai only on 26th. Career-wise, Murugadoss is on a real high after the back to back successes of Thuppakki and its Hindi version Holiday, and will be looking to achieve his hat-trick with Kaththi, which is set for a release this Diwali. People looking for online information on A R Murugadoss, A R Murugadoss birthday, Kaththi, Vijay will find this news story useful.